Hand painted Pitcher. A perfect pitcher to have around your kitchen or to add a whimsical touch to your table. Made of stoneware, this pitcher comes in handy for serving tasty beverages to your friends and family. This lovely pitcher also makes a beautiful flower vase. 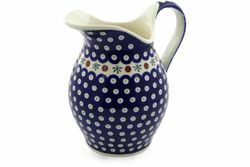 Order this addition to your polish pottery dinnerware set today - it will quickly become a family favorite.